BirdLife Malta is asking the public to report any sightings or findings of Scopoli’s Shearwater (Ċiefa) which may have become stranded during their first flight so they can be safely released back at sea. At this the time of year, these secretive seabirds begin to fledge from the nests for the first time from within the cliffs. Fledging at night, these young birds use the light of the horizon to guide them away from the coast, however the increasing threat of on-land light pollution can disorientate the birds causing them to become stranded inland, appearing in roads, seafronts, towns and other urbanised areas, and unable to fly back out to sea whilst putting their survival in danger. The areas where they are usually found are Ħal Far, Xlendi, Ċirkewwa, Birżebbuġa, Ġnejna Bay, Marsalforn, and St. Paul’s Bay. The Scopoli’s Shearwater, the larger of the two shearwater species, has an estimated population of 4,500 pairs in Malta – approximately 5% of the world breeding population. 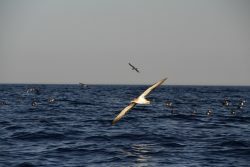 This protected species of seabird, which can be recognised by its grey-brown back with white underbelly and yellow bill, can often be seen ‘shearing’ over the tops of waves. The Scopoli’s Shearwater had been a focus of BirdLife Malta’s EU LIFE+ Malta Seabird Project which came to a successful close this year after securing Malta’s first eight marine Special Protection Areas (SPAs) and is set to also benefit from the conservation actions carried out in the current EU LIFE Arċipelagu Garnija Project.